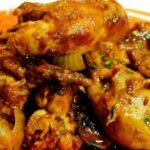 Chicken do pyaza recipe or Murg do pyaza is a mouth-watering dish with little sweet and sour taste. This sweetness comes from the use of plenty of onions. The sour taste, comes from adding souring agents like curd or lemon juice. To manage the taste and make it spicy, we use aromatic whole spices and chili. Popularly green and red chili are in use, though some also add capsicum to it. As said earlier for preparation of chicken do pyaza recipe a plenty of onions are used. Onions has numerous medicinal properties. Properties of onions have been known since ancient times. 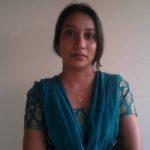 They are in use to treat headaches, heart disease and mouth sores from long time. Onions are also rich in B vitamins, folate (B9) and pyridoxine (B6), which play key roles in metabolism, red blood cell production and nerve function. They are also a good source of potassium. Onions contain antioxidants and compounds that fight inflammation, decrease triglycerides and reduce cholesterol levels. Their potent anti-inflammatory properties, helps reduce high blood pressure and protects against forming blood clots. Onions are an excellent source of antioxidants. In fact, they contain over 25 different varieties of flavonoid antioxidants in them. Escherichia coli (E. coli) & Pseudomonas aeruginosa – bacteria that causes urinary tract infection. Staphylococcus aureus (S. aureus) bacteria that causes pneumonia, heart valve infections, and bone infections. And Bacillus cereus – bacteria that causes diarrhea, nausea and vomiting. With this note you can understand the health benefits of onion and advantages of Chicken do pyaza recipe for non-veg lovers as chicken itself contain less saturated fat than red meat. Please do not forget to follow my onion rich MOONG DAAL RECIPE, ARHAR DAAL RECIPE if you are vegetarian protein lovers. According to one perception this dish was created when a courtier of Mughal emperor Akbar – Mullah Do Piaza accidentally added a large quantity of onions to a dish. But no Mughal-era records mention any courtier called Mulla Do-Piyaza. A second perception says the do pyaaza means two onions and therefore two onions are in use to prepare this recipe. But I suspect this second theory because it does not quantify the meat to go along with these two onions. Another theory suggests that the do pyaza is called so, because 2 types of onions are added in in the cooking process. 1 is spring onion and another is red onion. And the final suggestion says onions are added 2 times. Firstly, during preparation of gravy and then for tampering this recipe. This technique is also the most popular technique used in preparing this recipe. We will cook our Chicken do pyaza recipe using this popular technique. Now since spring onions or baby onions are available only between March through August. To prepare this recipe in other season I will suggest using upper portion of red onion for chopping. And use the central portion of bulb as replacement of spring onions or baby onions. The central portion of these onions is less mature and tastes similar like spring onions or baby onions. 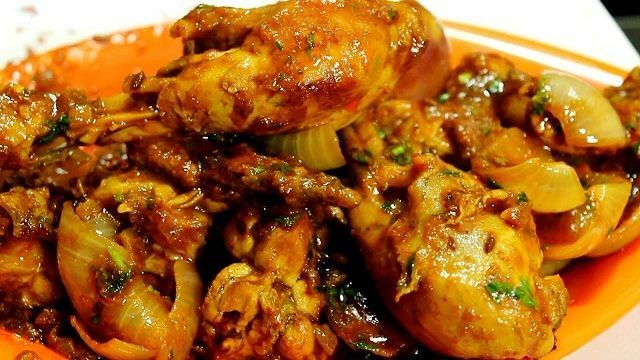 Chicken do Pyaza is little bit sweet, spicy and appetizing dish. Tt's got lots of onions. A thick and spicy Chicken preparation with double onion, a really widespread dish of Muslim cuisine. Here is a easy recipe to prepare Murg do pyaza at home. We start the chicken preparation by first marinating the chicken for 3-4 hours. Wash and Clean the chicken pieces. Remove any extra water in chicken pieces and make it dry. Then add ginger-garlic paste, roasted cumin seeds powder, garam masala powder, red chili powder, kashmiri red chili powder, coriander powder, turmeric powder and salt. Finally add 3/4 cup whisked curd. Mix well and rub the spices along with curd on all the chicken pieces. Cover it and keep it aside for 3-4 hours in fridge. After 3-4 hours we will start preparing our Chicken do Pyaza Recipe. How to prepare gravy for Chicken-do-Pyaza Recipe. In a kadhai , heat the ghee or oil what ever you are using, on medium flame. Now add the bay leaf and whole spices then add the ginger garlic paste. Then add the chopped onions. Cook then till they are golden. Make sure not to burn the onions. Now add chopped tomato and salt. Remember we have also added salt during marinating chicken, thus add accordingly. Also Add turmeric powder and kashmiri red chili powder. Cook till all the raw smell disappears and the oil separates from the paste. To protect spices from burning you can also add a little water at this point. When the oil separates add the marinated chicken pieces. Stir fry, until the curd is very well incorporated in the gravy. This should take 2-3 minutes. Stir everything well. Cook covering the wok and let the chicken cook on low flame for 8-10 minutes. Check occasionally after every 2-3 minutes and stir well, so that the chicken should not stick at the bottom and your recipe get burnt. You might have noted that we have not added any water into this recipe till now. This is because the curd and tomatoes in this recipe will emit water and the chicken pieces will get cooked in this water itself. After 8-10 minutes you will find lots of water in this recipe that got emitted out from tomatoes and curd. Now turn the flame to high, and cook it without covering the lid, stirring gently and continuously. We need to cook it till the water dries up and oil seperates from the gravy. It will take around 3-4 minutes. Now add a little water (around 2 tablespoon), cover it and turn the flame to low. In a fry pan add 2 tablespoon of oil and put it over high flame. When the oil gets hot turn the flame to medium then add 1 teaspoon of coriander seeds, half teaspoon of cumin seeds and 4-5 whole red chilies brocken into half. Fry a little. Now add the pearl onions. if you want to use then also add capsicum chopped into cubes. Cook and fry them a little on low flame for 3-4 minutes. Don't forget to stir it occasionally. Now transfer this mixture over the chicken getting cooked on other pan. Add a pinch of garam masala powder. Mix well. Cover the pan and cook a little for a minute. After a minute close the heat. Let the chicken rest for 2-3 minutes. Your hot, spicy sweet and sour Chicken do Pyaza is ready to serve.